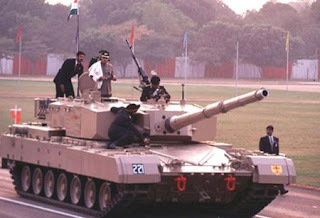 The phase one production of Arjun Mark-II will be completed by July 2011 and phase two production with 93 new improvements will be completed by June 2012, said P Sivakumar, Director of Combat Vehicle Research and Development Establishment, a wing of the DRDO. In Phase-I, 45 tanks will roll out with 56 upgrades, including the missile firing capability and the enhanced night vision, and in Phase-II, the remaining 79 tanks, with all the 93 improvements, will come off the assembly line. “By 2013-14, the first batch of 30 tanks will reach the ground,” Sivakumar told Express. Addressing a seminar at Anna University, Sivakumar also mentioned the need for defence establishments to reduce the weight of combat vehicles like tanks. “Material sciences and nanotechnology play a significant role in this change. At present Arjun tanks weigh 60 tonnes. But there may be a demand to reduce the weight to 50 tonnes to improve mobility. This can be achieved to some extent by applying nanotechnology in reducing the thickness of armors while retaining their strength,” he said. The DRDO research and innovation center at IIT-Madras Research Park will try to work and address such needs by collaborating with educational institutions, Sivakumar said. “The center will become operational by July and we look to pool in resources from students of IIT-M and Anna University to conduct futuristic research at this centre, different from projects going on in the regular DRDO labs,” he said. The focus of this research centre, according to Sivakumar, will be on developing the suspension technology. “India is a leader in hydropneumatic suspension technology and we are looking to broaden the scope further through this centre,” he said.